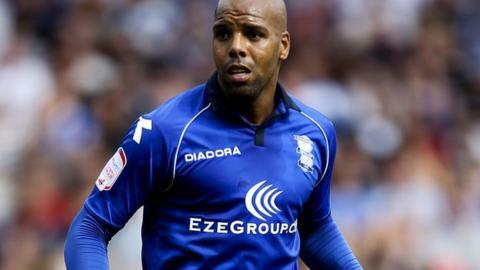 Marlon King's hat-trick helped Birmingham City produce a stunning fightback and earn a 3-3 draw at Championship rivals Millwall. The Lions raced into a 3-0 lead inside 18 minutes at the New Den after ex-Blues striker Chris Wood netted either side of Chris Taylor's strike. But King handed a lifeline to the visitors in first-half injury time. He scored again shortly after the restart before completing a remarkable comeback after 63 minutes. The visitors almost snatched victory in the latter stages with Nathan Redmond twice being denied by Millwall keeper David Forde. The draw eased some of the pressure on manager Lee Clark, who has led fifth-bottom Birmingham to just three league wins since taking over at St Andrew's in the summer. The Blues won 6-0 on their last visit to Millwall in January, but it looked as if the Lions would have their revenge with three goals in the space of seven first-half minutes. Wood slipped away from his marker to head in the opener and two minutes later Taylor drove home a fierce shot from close range. On-loan West Bromwich Albion striker Wood struck again when he met Liam Feeney's right-wing cross with a firm 12-yard shot past England goalkeeper Jack Butland. Birmingham are enduring their worst start to the season since the 1980s but were given hope when King collected a pass from strike partner Leroy Lita and dispatched a right-foot shot beyond Forde from six yards. And the pair teamed up again four minutes after the break. Lita found King in the box and he responded with an ice-cool finish from 12 yards. Suddenly Birmingham looked a side bursting with confidence and they earned a point when King converted David Murphy's left-wing cross with a crisp strike. Birmingham boss Lee Clark: "I didn't think it was over, even when I was standing there at 3-0. I just felt the game hadn't gone from us at that stage. "I had some sort of belief the players could turn it around and getting a goal before half-time was important for us. We had chances to win it in the second half and it was probably our best half of the season." Millwall boss Kenny Jackett: "It was very frustrating from a winning position. The goals against column for us so far this season is embarrassing. "It is why we are where we are. You can't give three goals away and expect to get anything on too many occasions, which was a great shame because it covered up some of the best attacking football we have played this season."